The Serpentine Library: Less Than A Week To Go!! Here is a book that I can't wait to read and it's coming out next Tuesday! You're probably thinking: umm Maria, why didn't you use Hex Hall as your Waiting on Wednesday this week? Hmmm. . .well, I try to use W.O.W posts for books that are at least two months or so away from being published, books that I'm really excited about but have to wait a long time for. And since Tuesday is only 6 days away, I thought I would give Hex Hall, it's own spotlight post. Summary from Goodreads: When Sophie Mercer turned thirteen, she discovered that she was a witch. It's gotten her into a few scrapes. Her non-Gifted mother has been as supportive as possible, consulting Sophie's estranged father--an elusive European warlock--only when necessary. But when Sophie attracts too much human attention for a prom-night spell gone horribly wrong, it's her dad who decides her punishment: exile to Hecate Hall, an isolated reform school for wayward prodigium, a.k.a. witches, fae, and shapeshifters. By the end of her first day among fellow freak-teens, Sophie has quite a scorecard. Three powerful enemies who look like supermodels; a futile crush on a gorgeous warlock; a creepy, tag-along ghost; and a new roommate, who happens to be the most-hated person and only vampire on campus. Sophie soon learns that a mysterious predator has been attacking students, and her friend Jenna is the number one suspect. Meanwhile, Sophie has a more personal shock to grapple with. Not only is her father the head of the prodigium council, he's the most powerful warlock in the world, and Sophie is his heir. As a series of blood-curdling mysteries starts to converge, Sophie prepares for the biggest threat of all: an ancient secret society determined to destroy all prodigium, especially her. 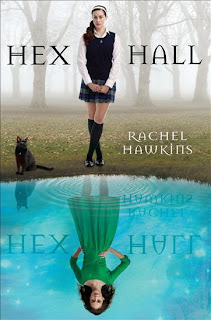 To learn more about Hex Hall or Rachel Hawkins visit her blog. Is there a book coming out next week that you are excited about? Let me know in the comments. I have heard such awesome things about this book. I am excited for this one as well! Yes! Can't wait for this one! I have been waiting for this book for quite a while now. We'll have to see what everyone thinks!!! I've heard so many good things about this one! I can't wait for it either! I hadn't heard about this book, but it sounds like it would be right up my alley! Thanks for telling me about it! It's definitely going on my booklist! I can't wait to read your review!